Greg Christie – GCW Kitchens and Cabinetry Inc.
Greg began his Kitchen Design career at a very early age. Greg has extensive experience in the design, sales, manufacturing and installation of cabinetry, giving him a unique perspective on how various levels and dimensions work together in cabinetry design. Greg has won many awards for his design work in Stratford, London & St. Thomas. 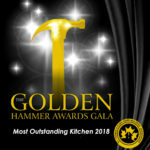 Twice Greg has won the coveted “Most Outstanding Kitchen” award from the LHBA (London Home Builders Association). Greg understands that this industry is constantly changing and that keeping up with current trends in design and fashion are key to his success.